Offshore Wind Farms: Technologies, Design and Operation provides the latest information on offshore wind energy, one of Europe’s most promising and quickly maturing industries, and a potentially huge untapped renewable energy source which could contribute significantly towards EU 20-20-20 renewable energy generation targets. It has been estimated that by 2030 Europe could have 150GW of offshore wind energy capacity, meeting 14% of our power demand. 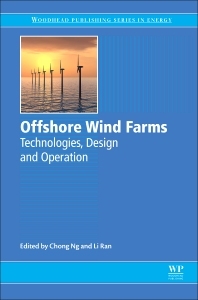 Offshore Wind Farms: Technologies, Design and Operation provides a comprehensive overview of the emerging technologies, design, and operation of offshore wind farms. Part One introduces offshore wind energy as well as offshore wind turbine siting with expert analysis of economics, wind resources, and remote sensing technologies. The second section provides an overview of offshore wind turbine materials and design, while part three outlines the integration of wind farms into power grids with insights to cabling and energy storage. The final section of the book details the installation and operation of offshore wind farms with chapters on condition monitoring and health and safety, amongst others. Scientists, researchers and academics in the field of wind energy generation and renewable energy, from graduate level to research professors. Dr. Chong Ng works in industry and is Research and Development Manager at ORE Catapult’s National Renewable Energy Centre, UK. Li Ran joined the University of Warwick as a Professor in Power Electronics Systems in 2012 and also acts as a Deputy Director for the State Key Laboratory in Power Transmission Equipment and System Security of China.